Animal Models of Human Inflammatory Skin Diseases features the principles and practices of how to go about studying inflammatory skin diseases using live animal models. 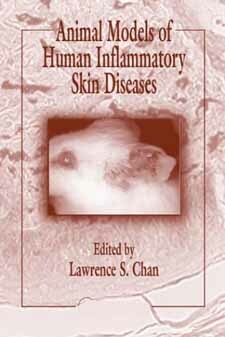 On the principle side, the book describes the comparative structure and function of the skin, and the comparative immunology system in animal species commonly used as models. From the practical perspective, it presents a general discussion on methods of experimental animal modeling and contains specific expert experience on individual models. The authors include a detailed method of disease induction for each model, present chapters on comparative histology and immunology, and discuss potential targets of disease intervention. Written by biomedical investigators with first-hand experience in their chosen fields, this book is a valuable guide and reference for investigators in the biomedical and pharmaceutical sciences. It provides an instantaneous comparison between the skin structure and immunology of humans and animals, aiding in the interpretation and application of pathologic and immunologic findings.